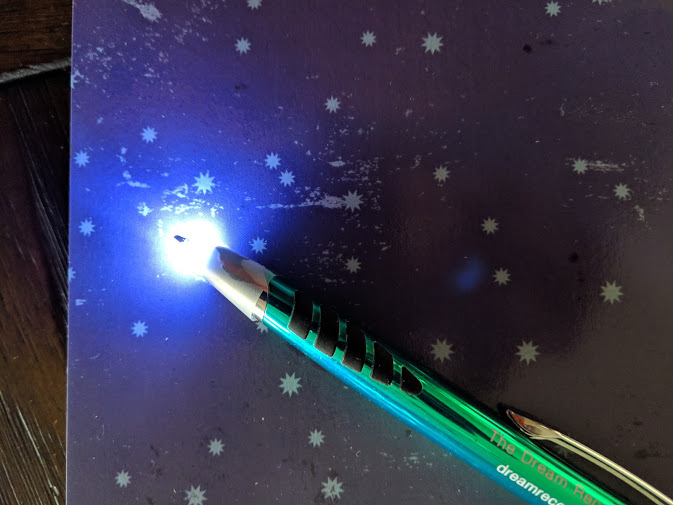 Does the shock of the bright light emitting from your light pen make you want to give up dream journaling? Seeing any kind of light in a darkened room in the middle of the night can be uncomfortable. With your pupils fully dilated after you wake from sleeping, the light pen can seem more like a torture device than a writing utensil. Yet you’re probably going to need some light. Without any, what you’re going to write will end up being unreadable. That won’t do you any good. When it comes to misery from the bright light, it’s more the reflection than the light. If the light bothers you, try putting a piece of tape at the end of the lighted pen. That might cut the glare just enough so it stops being a deterrent to journaling. Different types of tape can be used as an eyeshield. Clear, cellophane tape would dim the light comparatively little. Masking tape — especially two pieces stuck together — would dim it a lot, making it so the light would only come out the end. You can also try tinted tape as well. Another thing to try is looking at the page and light only out of the corner of your eye. With a little modification, the pen can journal your dreams with more comfort for your eyes than they ever had before.